Beautiful and unique design by Liz Soto. 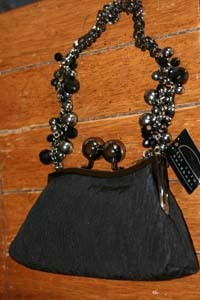 This beautiful evening handbag is black satin with a beaded handle. 8" x 4.5" x 1.5"
Beautiful and unique design by Liz Soto. 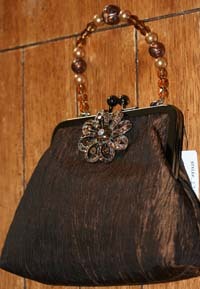 This beautiful evening handbag is brown satin with pin and beaded handle. 8" x 6" x 2"
Beautiful and unique design by Liz Soto. 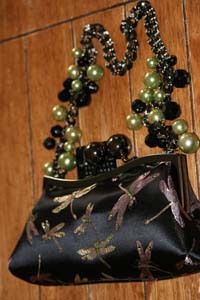 This beautiful evening handbag in dragonfly fabric (crystals on some of the dragonflies) with a beaded handle. 8" x 4.5" x 1.5"
Beautiful and unique design by Liz Soto. 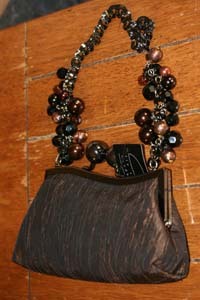 This beautiful evening handbag is brown satin with a beaded handle. 8" x 4.5" x 1.5"